Paul E McGinniss, The New York Green Advocate, On The Road in His Prius Plug-In-Hybrid as part of the 2013 Prius Plug-In-MPG Challenge. The location is Oliverea in the Town of Shandaken, Ulster County, at The Alpine Inn where the Headwaters of the Esopus Creek border the 69 acre property. The Alpine Inn is for sale by Paul E McGinniss Real Estate. This incredible Inn is at the very center of the Catskill Forest Preseve and has been in the same family for over 70 years. This is the heart of the Catskill Watershed / Catskill Forest Preserve and is adjacent to many acres of New York State preserved land which supports clean and healthy drinking water enjoyed by the population points South including New York City. Paul is wearing his Waterkeeper Alliance cap, Waterkeeper Alliance being the charity for which Paul is competing in the 2013 Prius Plug-In-MPG Challenge. 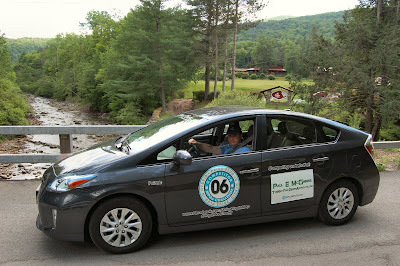 The charity I am competing for in the 2013 Prius Plug-In MPG Challenge is New York-based Waterkeeper Alliance, a global movement of on-the-water advocates who patrol and protect over 100,000 miles of rivers, streams and coastlines in North and South America, Europe, Australia, Asia and Africa. I would like to thank Earth Day NY for facilitating my participation in the Prius Plug-in-MPG Challenge and Element, Times Square West for providing hotel accommodations while I was in NYC for the Challenge.